Interviews: Gianluca Lia. Video: Chris Sant Fournier. 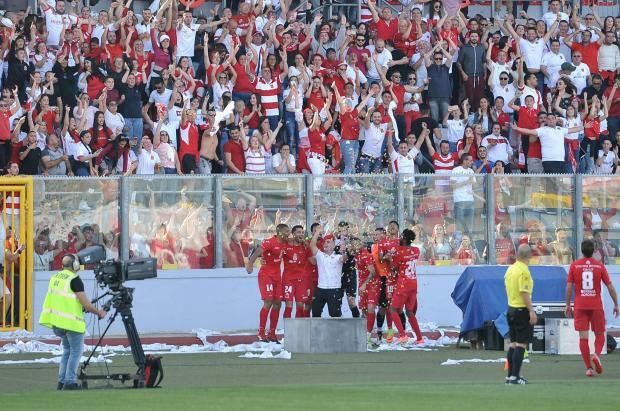 Valletta were crowned champions for the 24th time in the history after the Citizens had the better of Gżira United 2-1 while their rivals Balzan were beaten by Hibernians 1-0 at Corradino. Matteo Piciollo put the Citizens ahead after only seven minutes. Kyrian Nwoko made all the damage as the Malta striker sped clear on the right to pick Raed Saleh who quickly fed Piciollo and the Italian striker made no mistake. Valletta continued to dominate proceedins and they sealed the points midway through the second half when Santiago Malano play in Saleh and the Oman midfielder sent Curmi the wrong way to make it 2-0. Gżira pulled a goal back ten minutes from time when Ryan Camilleri brought down Juan Corbalan and Andrew Cohen made no mistake from the spot. But that little mattered as Valletta held on for the win. At the Corradino Stadium, Hibernians needed an early second half goal from Clayton Failla to kill Balzan’s title dream. The wing back headed the ball past Balzan goalkeeper Sean Mintoff to earn the points to the Paolites. Still it turned out to be a useless victory for Hibs who missed out fourth place to Birkirkara who came from behind to overcome Ħamrun Spartans 4-2. In the other match, Floriana trounced Lija Athletic 6-2.